White cabinets remain at the top of kitchen wish lists. But they’re not for everyone. The following kitchens, pulled from the most popular photos uploaded to Houzz since Jan. 1, 2018, feature cabinets in various takes on wood and paint tones to create spaces that range from rich and warm to light and airy. We saved the most popular for last. 11. Sage advice. In England, a cloudy green paint color establishes a soothing farmhouse vibe. 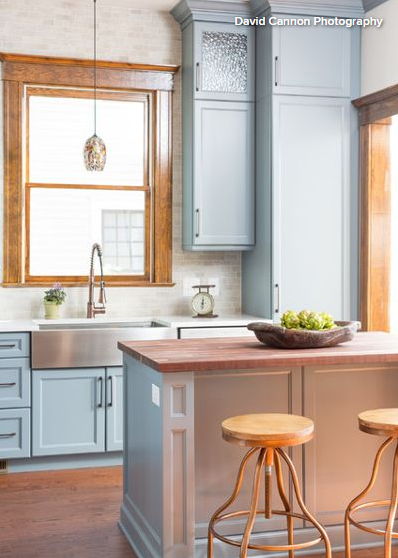 Natural light shines on a copper farmhouse sink, creating an artificial sun of sorts that’s further reflected by brass cabinet hardware, only to be tamed by dark countertops. 10. Au natural. 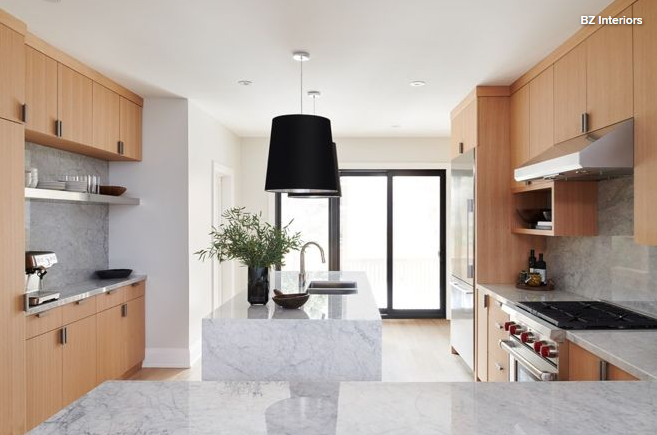 Flat-panel rift-cut white oak cabinets in a natural stain join backsplashes and countertops made from large slabs of Bianco Carrara marble to establish a weightless palette that enhances sunlight from rear sliding doors. 9. Call of the Craftsman. 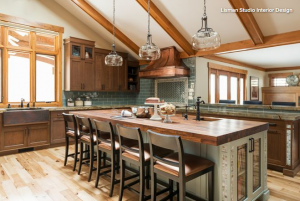 You’d be hard-pressed to argue that this Utah kitchen doesn’t come off as warm and inviting. 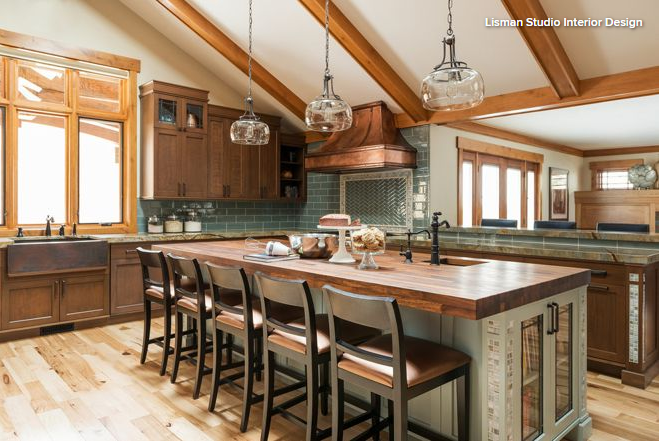 That large wood island countertop looks more beckoning than a roaring fireplace. 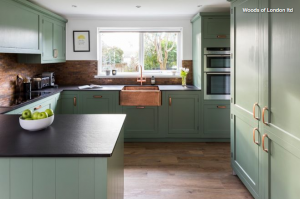 The rest of the wood tones, mixed with light green paint on the island base and blue-green backsplash tile, push the stay-awhile vibe even further. 8. Baby blue redux. Light blue also shows up in this Vermont farmhouse kitchen. 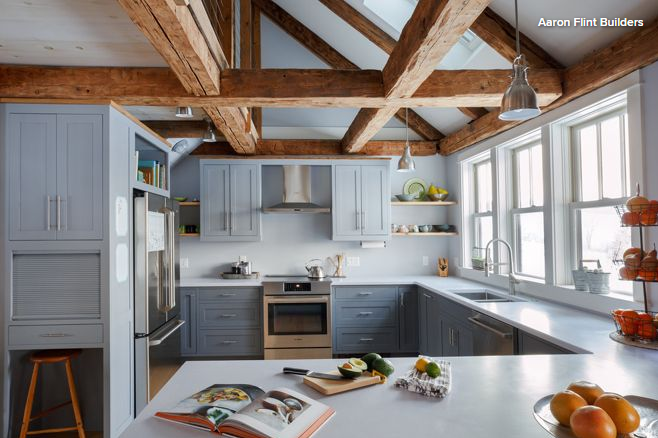 Light from a skylight floods through 200-year-old wooden beams for a bright but peaceful space. 7. Get the baby blues. Light blue is perhaps the most effective color for creating a bright, neutral look that seems as though it has a lot of color to it. Plus, warmth goes a long way to making a space feel welcoming, and the rich woods featured here get the job done nicely. 6. Awe-inspiring in Auckland. New Zealand is known for its captivating outdoor scenery. 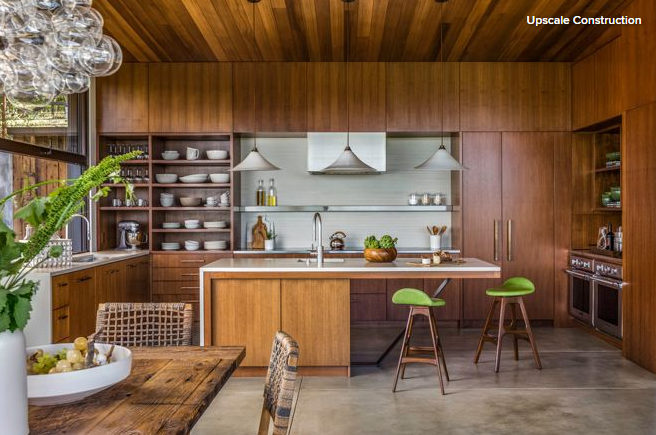 But this kitchen isn’t bad to look at either. The crisp white floor and ceiling sandwich a well-tailored palette of light wood and blue-gray for a light look that makes a hefty impression. 5. Paint it black. Going with black cabinets can be quite daunting — but I wish people did it more. Because, boy, does it pay off in some cases. This Toronto kitchen is a fitting example. 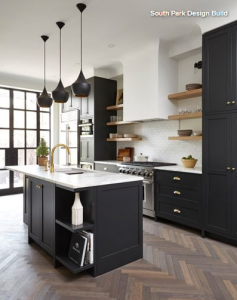 Black cabinets get offset by natural light and doses of white on the countertops, backsplash, walls and range. 4. Into the woods. The walnut cabinets and ceiling treatment provide enveloping warmth and contrast with the light gray concrete countertops, backsplash and floor. 3. Dark and dapper. Similarly, a wall with several large windows brings enough light into this Denver kitchen that the homeowners were able to go on the darker side with the finishes. 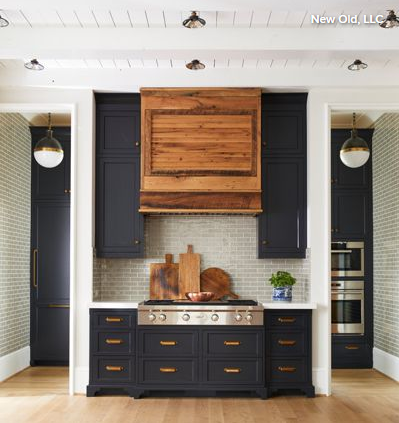 That includes a moody stain on the white oak cabinets, richly multicolored blue tiger’s-eye countertops and lots of steel on the island. 2. Marvelous at midnight. 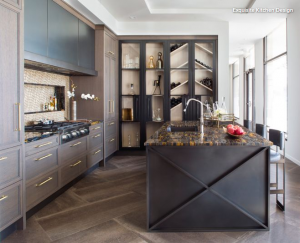 This rich cabinet color might make some spaces feel dark and heavy. 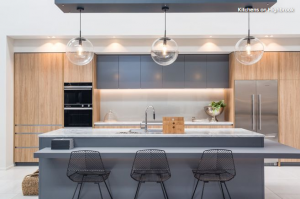 But with a soaring ceiling, light wood flooring, a generous amount of smoky gray wall and backsplash tile, and an expansive floor plan, the look comes off as nothing but bright and open. 1. Going gray. 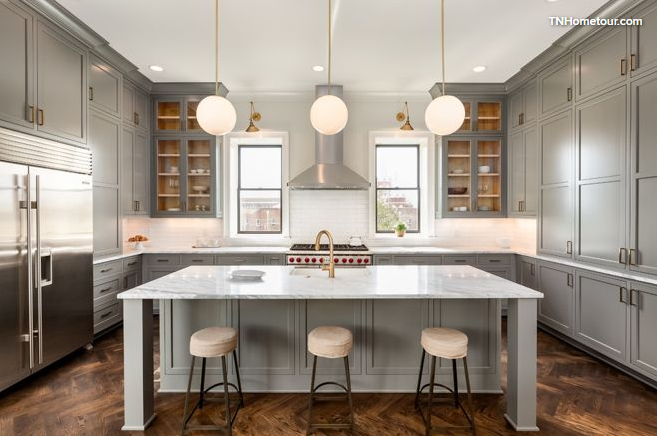 Sophisticated gray cabinets envelop this spacious Nashville, Tennessee, kitchen, where storage likely will never be a problem for the homeowner. A herringbone-patterned wood floor, brass accents, spot-on symmetry and even thoughtful details like the glimpse of cabinet wood behind the glass doors come together to create a near-perfect kitchen. All available at Kitchen EXPO!!!!! 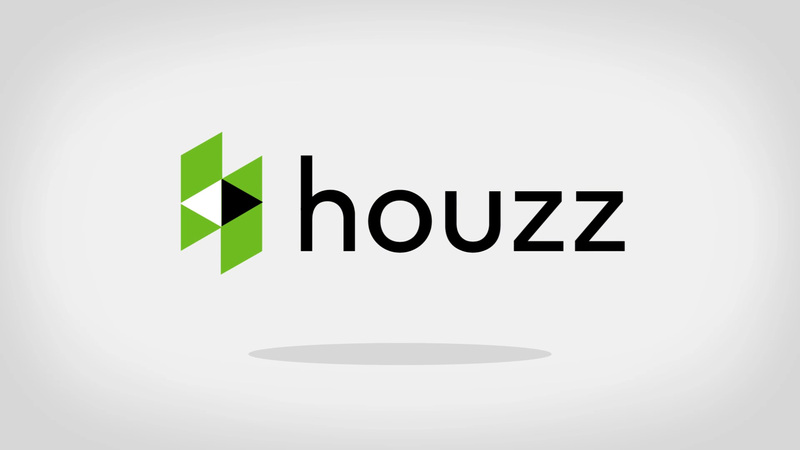 ©2015 Kitchen Expo. All Rights Reserved.